Born on September 11th, 1963, in Plovdiv. He graduated from the National High School of Fine Arts ”Tsanko Lavrenov” in Plovdiv in 1982. Grandson and disciple of the great Bulgarian artist Pascal Struzhev. Later he did mainly drawing and painting. Then he experimented plastic whith enamel and performed artistic mosaic. During this period in the 80s implemented two successful projects whith painting and plastic in Plovdiv, Bulgaria. After 1985 he working with enamel, creates artistic mosaic and participated in the execution of the monumental mosaic designed by Boris Dimovsky in Haskovo. Between 1990 and 1993 he worked drawing and painting in Saint Johns and Montreal, Canada. In 2001 he participated in the elaboration of the sculpture figures ”Angels”, which were sets for the staging of Marius Kurkinsky, based on the play ”The art of the comedy” by Eduardo De Filippo. 2012 – Award for artist, N Form, painting, plastic art, Association of the artists in Plovdiv, Bulgaria. 2014 – Monumental mosaic, The Eye of God, Transfiguration of Our Lord Church, Pomorie, Bulgaria. 2015 – Monumental mosaic, dedicated to great composer Asen Diamandiev (16.11.1915 – 24.2.2009), Plovdiv, Bulgaria. Jorj Sopadjiev works in the fields of design, decoration, drawing, painting , wall painting, installation, plastic art, monumental mosaic, performance and pfotography. He has made over thirty solo exhibitions. Galleries and private collections in Bulgaria, Serbia, Germany, Italy, France, Turkey, Canada and USA prossess works, done by him. 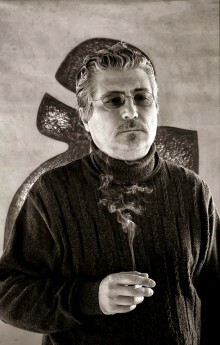 He is a member of the Association of the artists in Plovdiv and Union of Bulgarian Artists. He lives and works in Plovdiv, Bulgaria. NEDEV Art Gallery, Stara Zagora. Jorj Sopadjiev with Nenko Chanev, Lik Gallery, Sofia. The Society of Plovdiv Artists, 15Х5. Nomination for Painting, Union of Plovdiv Artists. The Society of Plovdiv Artists. Art Bazar Bansko, painting, mosaic. sculpture, Union of Plovdiv Artists. 2015 – Aura Project, A+Gallery, painting, Plovdiv. Maria Luiza Club, Night of Museums and Galleries, Plovdiv. Hotel Hebros Art Center, Plovdiv. 2014 – Pictursque planer, Blagoevgrad. Association of the artists in Plovdiv. 2012 – Painting, Plastic Art, U-P.A.R.K. Gallery. Painting and Plastic Art, Plovdiv. in Naylon Art Club, Plovdiv. of The Private Galleries, Sofia. Art Gallery, The Old Plovdiv. Drawing in Naylon Art Club. Month of Culture, The Old Plovdiv. White Drawing and Work with Paper “. in Janet Art Gallery, The Old Plovdiv. Saint Johns and Montreal, Canada.